We camped here for a weekend... it was the 3rd time we have used one of the campsites at Falls Lake. 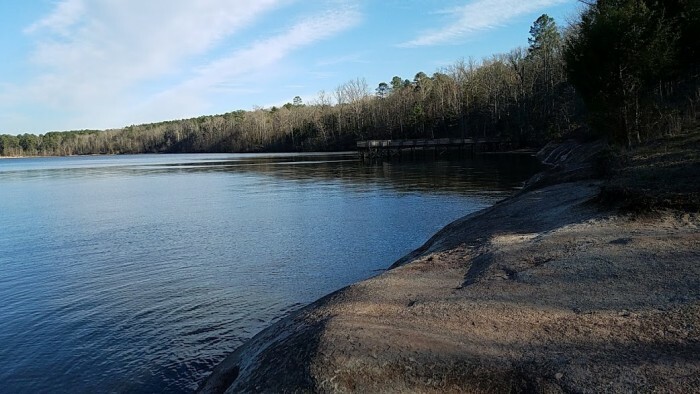 During winter months, Rolling View is the only campsite open at Falls Lake. We love the super spacious and wooded campsites, with plenty of trees and natural beauty. Nice hiking trails right here in the campsite that lead to Falls Lake, and right outside the entrance to the park is access to the "Mountain to Sea Trail". The rangers are very helpful... this is a really nice place to camp and it is inexpensive. 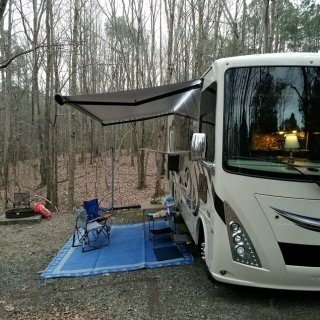 We camped at Falls Lake SRA / Rolling View Campground in a Motorhome. There is a Food Lion within 1 mile of the intersection of Baptist Rd. and Rt 98. 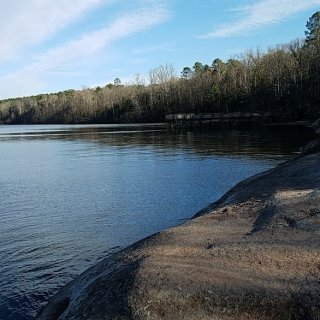 While camping at Falls Lake, make sure to do some hiking on the "Mountain to Sea" trail. The trail head is located just outside the entrance gate. This is a very small but beautiful RV park with only about 10 sites. Each site has a level concrete pad, fire pit, picnic table, and a great view of Pilot Mountain. The grounds have rolling grassy hills and a small pond. The bathroom facilities are immaculate, shower looks like it would be in a hotel resort. Extremely clean and well appointed. The campground is owned by a married couple who provide great service to their guests. The location is great... minutes away from Pilot Mountain State Park, about 20-25 minutes from Hanging Rock State Park, and close to Mount Airy ("Mayberry") and historic Winston-Salem. 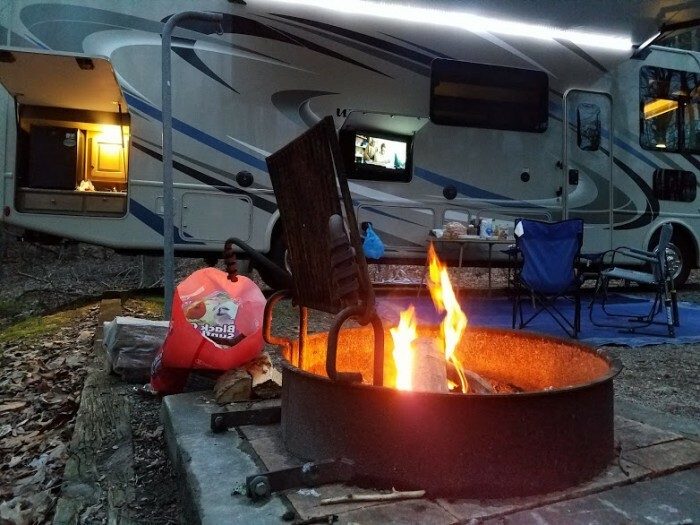 We camped at Greystone RV Park in a Motorhome. Definitely do the hike around the base of Pilot Mountain... amazing views and incredible rock formations! Also, check out Hanging Rock State Park, but don't miss the "Lower Cascades"... not well marked, but incredibly beautiful after a short hike from the parking lot. While there, don't forget to visit Mayberry (Mt. Airy) and have an ice cream float! We had a great stay at Mama Gertie's Campground! It is a beautiful campground on a mountain side. The upper sites have amazing views! The lower sites (where we stayed) are nicely terraced between sites, you have good privacy. The staff was friendly and the campground was very clean. We had absolutely no issues and will definitely be back. Our site (#14) was adequate, but the patio area was a bit tight. Next time we would definitely get a mountain top site, maybe even the one with the deck. The views are amazing. We have a 30' motorhome and tow-dolly. We had enough space to disconnect the tow dolly and put it off to the side, and pull the car in behind my rig. The site was just big enough but not spacious. One of the best features of this campground is the location. It is only about 2 miles from I-40. Right at that exit, there is a grocery store, shopping center and gas stations. It is also close to downtown Asheville, the Blue Ridge Parkway, and only 5 miles to Black Mountain. We enjoyed walking round Black Mountain, a quaint little town with lots of shopping. Also, don't miss a visit to nearby Montreat college... beautiful location. We camped at Mama Gertie's Hideaway Campground in a Motorhome. One of the best features of this campground is the location. It is only about 2 miles from I-40. Right at that exit, there is a grocery store, shopping center and gas stations. It is also close to downtown Asheville, the Blue Ridge Parkway, and only 5 miles to Black Mountain. We enjoyed walking round Black Mountain, a quaint little town with lots of shopping. Also, don't miss a visit to nearby Montreat college... beautiful location. Loved this campground! We stayed at few sections back from the beach under some nice shade trees. The campsites are situated to face the afternoon sun, so being under a tree definitely helped as the sun is pretty strong on the camping side, even with awnings out. The site we were on had a dirt base with some roots. It was fairly level and we had no issues leveling our rig. Many of the sites had concrete pads, the details of each site (trees, whether or not there is a pad, and size) are listed when you book online. We had good utility connections... 50 amp power, water and sewer. We also had cable TV connection. We had an issue with the cable, and told them and within minutes someone showed up to fix it.. great service! 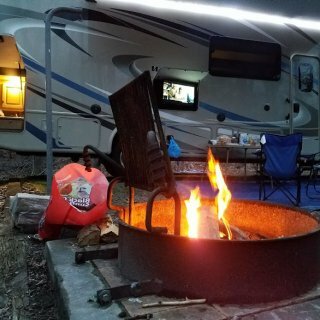 One thing that surprised me was there was no fire pit at each campsite... we noticed some campers brought their own portable fire pit... so if you plan to cook s'mores, remember to bring your own fire pit! We rented a golf cart and enjoyed zipping around this huge property. You can park them right at the beach entrance. There were several beach entrances, each one had a shower and ample golf cart parking. If you come here, definitely plan to rent the golf cart (or bring your own)... it is the best way to get around. They told us there were like 29 miles of streets and roads within the property. We did use the bathroom facilities a few times ... showers were modern, clean and good water flow. I would recommend this campground in the Spring or Fall... I was told that during the summer it is quite noisy and crowded. 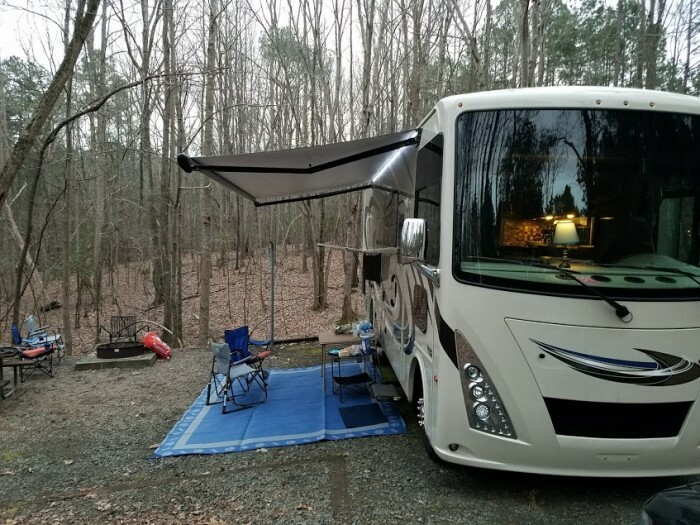 We camped at Ocean Lakes Family Campground in a Motorhome. Rent a golf cart... definitely worth it! If hot weather is expected, you may want to choose a shady spot near the rear of the campground as the sun is pretty hot on your rig if you are close to the beach. This was our first camping experience with our new Class A motorhome. We were very impressed with the size of each campsite. Very wooded and lots of buffer between spots. Free dump station available. Nearby were hiking trails and access to the beach/lake. We camped at Falls Lake SRA / Holly Point Campground in a Motorhome. There is a nice Harris Teeter grocery store within a few miles of the site (go west on Rt. 98).